The marketing description of the new Denzel Washington/Chris Pine thriller Unstoppable unapologetically bills the movie as “an adrenaline rush” and by the end of the opening track (“Stanton, PA”) the soundtrack is already on board with this description. From this moment on, the action hardly lets up. It’s as if director Tony Scott took composer Harry Gregson-Williams (The Town, The Chronicles of Narnia: Prince Caspian) and told him to make sure that there is absolutely no musical downtime in this story of an unmanned runaway train and the two men charged with stopping it. This collection of music effectively instills a sense of unending action into the film, but in soundtrack form it’s a bit forceful on the action and light on the thought. Aside from the back and forth in the track “Realign The Switch,” which starts out quietly but with a persistent ticking in the background and is back in full force within 30 seconds, there’s not much down time here. And though “Realign The Switch” does come back to some quieter moments as the track progresses, even these are suddenly split apart by pounding electronic beats, destroying any sense of contemplation that was created. Though I’m sure this was Gregson-Williams intention – reminding audiences that it’s hard to focus on a difficult problem when pressure is constantly building all around you – it only contributes to the antsy driving force of the album. (The end of the track “Will Guides 1206” is the exception here, with its gentle, emotional undertones – but as these fade into the fierce strings of “The Stanton Curve,” they’re also washed away). That being said, the action music here is impressive and exciting. Gregson-Williams finds a number of ways to express the ticking clock and the impending danger that the “unstoppable” train represents. From electronic to orchestral, the theme may be repetitive but Gregson-Williams never is, often making use of instruments and sounds that feel metallic or somehow representative of the engineering feats involved in the plot. In 42 minutes of music, Gregson-Williams hardly lets up on the gas, but he manages to vary his tone and approach to the action in enough ways to keep the music constantly engrossing and driving. For adrenaline junkies, this is a soundtrack (up there with Crank: High Voltage) that doesn’t let up. 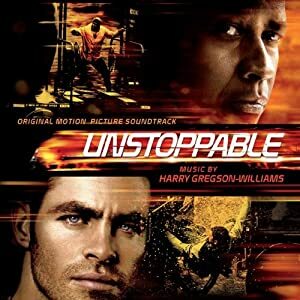 2 users commented in " Music Review: Unstoppable Original Motion Picture Soundtrack, by Harry Gregson-Williams "
Hybrid, an english breakbeat band helped in the writting of the score. Both of them collobrated on Wolverine last year. An oddity in the score: the electric cello used as the train’s theme/motif is strangely absent, with the exception of its brief appearance at the end of “Galvin’s Strategy,” which is not necessarily the same cue used in the film. This little bit of punctuation is sorely missed in the overall composition of the themes that (in the film) are very obvious.